LOS ANGELES, Calif., Jun. 29 /CSRwire/ - Smithfield Foods, Inc. donated more than 400,000 pounds of protein to the Los Angeles Regional Food Bank as part of the company’s 2018 Helping Hungry Homes® tour. Now in its 10th year, Helping Hungry Homes® is Smithfield’s signature hunger-relief initiative focused on helping Americans become more food secure. This donation, the largest in Helping Hungry Homes® history and equivalent to more than 1.6 million servings, will help support the estimated 1.2 million people in Los Angeles County who live with food insecurity. 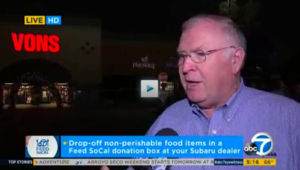 Smithfield presented the donation to the Los Angeles Regional Food Bank at the 7th Annual Feed SoCal Stuff-A-Truck event, hosted by Vons and ABC7 in Redondo Beach. Members of participating organizations discussed food insecurity in the local community and the significance of this donation and event, which will provide protein and other food resources throughout the food bank’s service area. This is the 32nd large-scale protein donation made by Smithfield to food banks across the country during the company’s 2018 Helping Hungry Homes® tour. Since the program’s inception in 2008, Smithfield has provided more than 100 million servings of protein to food banks, disaster relief efforts, and community outreach programs nationwide. Smithfield’s Los Angeles, California facility employs more than 1,200 area community members, and has participated in every Annual Feed SoCal event for the past seven years. Smithfield Foods’ support aligns with the company’s commitment to contribute to the vitality of the communities where its employees work, live, and raise their families. The Los Angeles Regional Food Bank has worked to end hunger in Los Angeles County since 1973 and has distributed the equivalent of more than 1 billion meals across our community. The Food Bank provides food to more than 300,000 clients on a monthly basis and distributed 70 million pounds of food in 2017 to children, seniors, working families, veterans and other neighbors in need. To support the vision that no one goes hungry in Los Angeles county, food and products are distributed through a network of more than 650 partner agencies, directly to children through our Children’s Backpack and Summer Lunch programs, to approximately 27,000 seniors each month through our Senior Nutrition program, and to working families and college students through our Mobile Food Pantry. The Los Angeles Regional Food Bank is a 4-star rated charity by Charity Navigator. For more information, visit lafoodbank.org/.